Concrete pedestrian safety infrastructure, such as sidewalk bumpouts and pedestrian islands, help make walking safer and more convenient, but concrete infrastructure can cost several tens of thousands of dollars to install. Earlier this month the village of Oak Park, a suburb of Chicago, tried a relatively inexpensive, flexible strategy to test out an intersection improvement before committing to setting it in stone. Workers installed a neckdown at Cuyler Avenue and Fillmore Street using DezignLine PedRail, a modular barrier between pedestrians and motorized traffic created by the Minneapolis-based safety infrastructure company DezignLine. The system consists of steel rails that are bolted into the pavement, with high-visibility flexible posts to help prevent drivers from running into them. The rails can be used for temporary tests, or as permanent barriers, according to the company. The materials for the Oak Park installation were manufactured by the Minneapolis-based bike rack company Dero and installed by the city of Oak Park. The intersection is located just southeast of Washington Irving elementary school. According to Dero rep Jason Jenkins, a former Active Transportation Alliance staffer, there were previously problems with impatient drivers whipping around corners during pickup and drop-off times, resulting in children and parents nearly being struck. The railings, which took three hours to install, reduced the pedestrian crossing distance from 31 feet to 15’8”. Jenkins noted that the project cost a fraction of the price tag for pouring concrete, and the design can easily be modified if necessary. Although a couple of sewer grates lie within the bumpouts, stormwater drainage shouldn’t be a problem since the rails sit two inches above the street. If Oak Park finds that the rail bumpouts (the product can also be used for pedestrian islands) have similar safety benefits as concrete infrastructure, it might make sense for Chicago to try this approach using PedRail or competing products. If lower costs and more flexibility – which could help reduce the potential for NIMBY opposition to street redesign projects – result in more bumpouts and islands getting installed across the city, that would be a net win for pedestrian safety. Basically a #Sneckdown. Well done!!! I wouldn’t like to see them become permanent as they’re just ugly. That said, as a testing tool, they seem like a really great idea. Figure out if there are any unforeseen issues caused by the design and adapt it, then go to permanent concrete. As an example, the initial design of the Lincoln Hub (Lincoln/Southport/Wellington, done with posts/paint only) was too restrictive on Southport in that if 2 cars were turning left (SB Southport to SEB Lincoln is common), there was no room to get around, leading to blocks long backups at busy times. A small tweak to make give a little more room alleviated the issue. If that had been done with concrete right off the bat, it would have been a disaster. Hi, Eva! Jason, the Dero rep mentioned in the article here. Thanks for your interest in the system. I think you’re spot on about the advantages of the adaptability as a pilot piece and the Lincoln Hub is an excellent example. 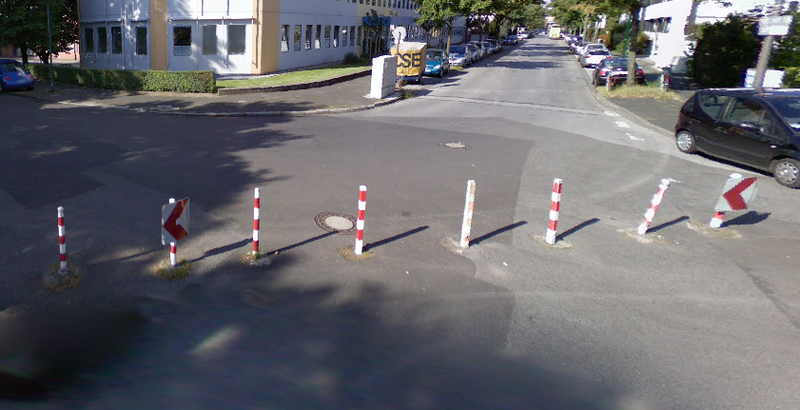 In that top photo, there are at least 40 bollards. That is not visually appealing. Other than that, the system looks fine to me. With the ease of installation and relatively low expense, hopefully aldermen in Chicago would be up for experimenting with this system. In a similar vein, I remember how bumpouts were tested on Clark St. in Andersonville years ago before concrete was poured. Those were done with bollard and paint. It was a valuable experiment. The original configuration proved to be too much of a pinch point, as the bumpouts would have trapped cyclists and forced them to wait for cars and buses to pass the bumpouts before cyclists could continue down the street. When concrete was poured, the size of the bumpouts was reduced somewhat so that they slowed motor vehicle traffic but still allowed some space for bikes to pass. They have slowed down traffic and created much safer crossing points for peds. How do these hold up against snow plows or even just bad drivers? I feel like they are going to be as resilient as those “State Law Pedestrian Crossing” signs that get put up in the middle of the road. Those seem to barely last a few weeks. Why does temporary and inexpensive always have to look so damn ugly? It should be possible to make a temporary barrier that’s just as cheap and effective but would be much less unpleasant to look at. That is why soft-posts are often used as well. They allow extra wide or emergency vehicles to pass, and then the posts just pop right up again. Honestly, these are horrid! Must everything be designed for bumbling fools holding the keys to SUV death machines? Patient and exact! Son, how would you like a job with the CTA? Jason with Dero here. I’m the rep from Dero, the company that fabricated these. 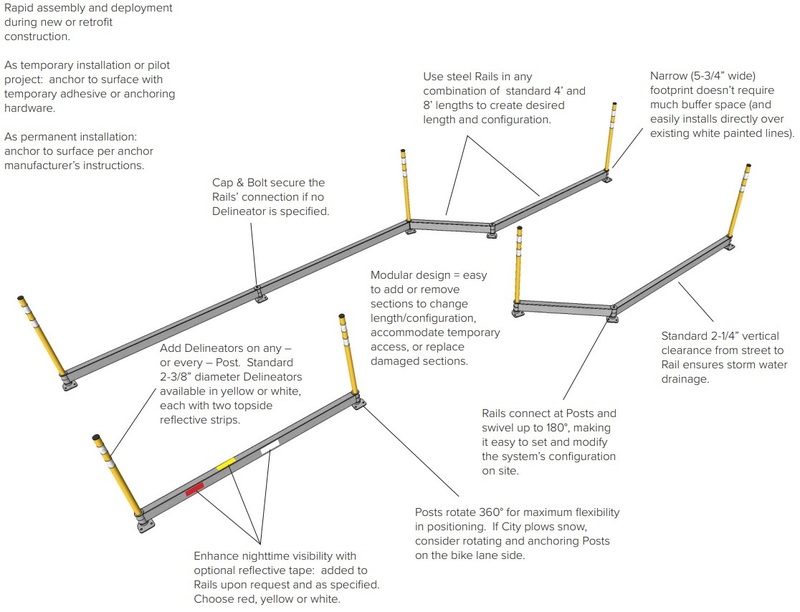 The PedRail and BikeRail systems are both intended to be used as both a pilot before pouring concrete or as a longer term solution. We’ve actually had them in a number of urban cores like downtown Minneapolis and New Orleans (as well as installations in about a dozen other locations nationally) where they have sustained multiple impacts from private, commercial, emergency and municipal vehicles including snow plows and none have needed to be replaced. The system uses approx. 1/8” thick steel wall tubing throughout and an extremely robust anchoring system. These features coupled with its ability to distribute the force of an impact throughout the system makes it extremely durable. But one of the many advantages of the system is that as a modular system if a portion is damaged it can easily be pulled and replaced quickly and cheaply. Likewise if the configuration shows that repeated impacts are happening in one section it can be reconfigured or removed completely just as quickly, easily and cheaply, unlike concrete. Please let me know if you have any other questions. Maybe yellow bollards? I think part of what makes this look garish is all the contrasting colors. Making the bollards the same color as the steel base should result in bollards that are still visible while reducing the unpleasing mess of colors. One idea: see if you can get something on the flexposts, like a loop or something, so enterprising neighbors can do things like string Christmas lights or yarn or whatever to make it more “owned” by the ‘hood. I think the current design is basically inevitably going to be a little on the ugly-side given how many flex posts there are and how obvious it’s supposed to look. To me they look like they have about twice as many spikes as they need. Also wouldn’t say red stripes improve their visibility? This is what posts look like in Germany. But what I find odd is the barriers on the sides of the crosswalk. What are they for? Unfortunately we give drivers licenses out like candy and rarely actually enforce driving laws across most of the US so…. yes. Bright and reflective doesn’t need to be so ugly. Form doesn’t need to be without function. Things can be made pretty and functional at the same time. In fact, making bulbouts pleasant to look at might actually improve its effectiveness.